1942 –Dad worked Marie had a good visit will take her to Bus (?) tonight at 8 at Newhall Ranch. Bud came by at 4 oclock. 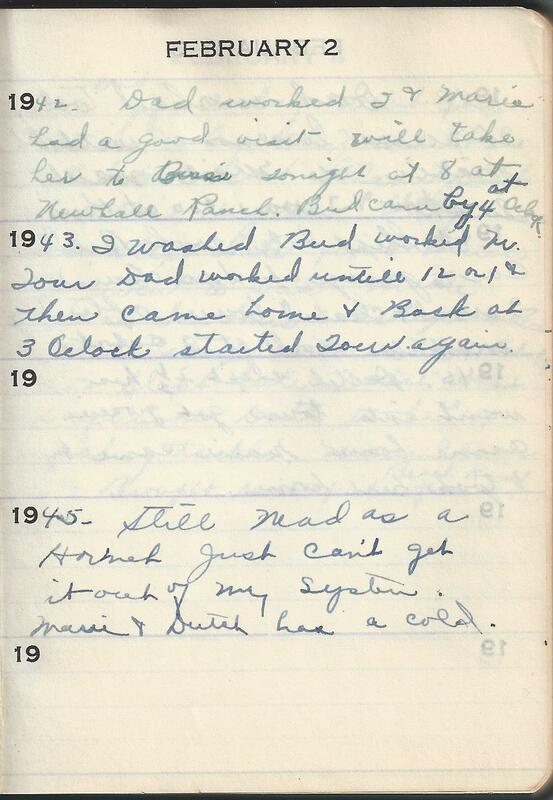 1943 – I washed Bud worked M. Tour Dad worked untill 12 or 1 & then came home & Back at 3 Oclock stated Tour again. 1945 –Still Mad as a Hornet Just can’t get it out of my system. Marie & Dutch has a cold. The Newhall Ranch grama is talking about in 1942 is interesting. It was a huge ranch in the Santa Clarita valley of California that the Newhall brothers owned at this time. Their dad had bought up several former Mexican land grants. He was quite successful at ranching. He granted the Southern Pacific Railroad a right of way and the first railroad tracks connecting the San Francisco area with Los Angeles were laid across his ranch. He had instructed his sons not to sell off the land when he died but 143,000 acres of ranch land was apparently not enough to support all five sons and their families in the lifestyle to which they had become accustomed. They began to sell off parts and soon realized that they couldn’t do that indefinitely. They then started selling off unproductive land and investing it right back into land for agriculture. They also struck oil in 1937 which helped a lot. The city of Valencia California occupies a small part of the old Newhall ranch now. Valencia, Saugus, Newhall, and Canyon Country merged in 1987 to form Santa Clarita.